"I know that people from around the world would come to drive across the deck of an aircraft carrier bridge, number one... Number two, it's the right thing to do from my standpoint because this is giving a testimony and a legacy memorial to our greatest generation." Three carriers connected end to end would complete the span, but two carriers would work well with ramps emanating from each shore and sloping up to the carrier's decks. One of the biggest things standing in the way of the "carrier bridge" is availability of the ships themselves. 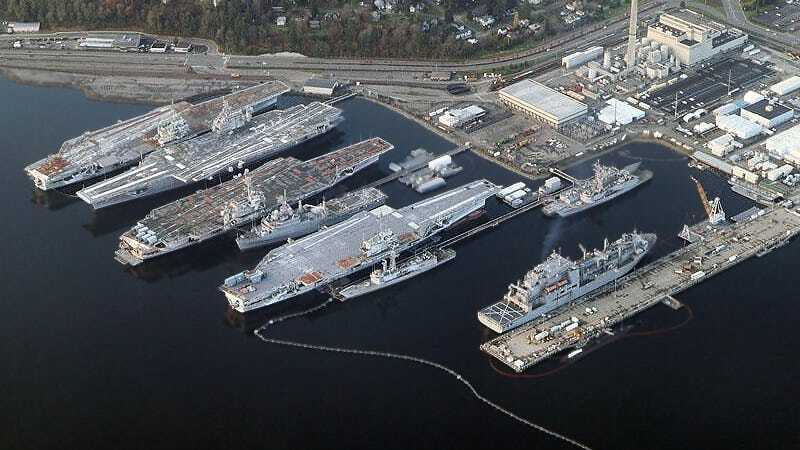 Although multiple carriers are in reserve or awaiting disposal at the nearby Bremerton naval base, the Navy says none of them are available for such a project. The two main ships eyed for the project are the USS Independence and the USS Kitty Hawk. The Independence is set to be towed to Texas for recycling this year and the Kitty Hawk is slated to remain in reserve until the Navy's newest carrier, the USS Gerald R Ford, is fully operational. Additionally, Navy policy for the big ships final fate states that they can only be used as museum ships or for disposal/recycling. The $90k federally funded feasibility study will have to be submitted by December of this year and from there it will be a fight to keep the idea in the state transportation budget and evolve its funding from there on a federal level. Reaction from the local public for the outside-the-box transportation solution is said to be positive but there are clearly many obstacles in its way. Yet for a state that loves to recycle and has a long naval heritage, anything is possible.